Several years ago we acquired a piece of prime real estate in one of the fasting growing areas of North Bossier. Architectural plans have already been drawn for a church and academy campus on this strategically located property. For the past two years our WOGM Bossier congregation has come together for weekly services at the Louisiana Boardwalk Regal Theater. If you live east of the Red River (or if you’re just curious about this campus) we cordially invite you to a service at 9:45 a.m. on Sundays. Even if you’re a regular attender at our Shreveport location, we encourage you to take one Sunday to visit Bossier. You’ll experience a welcoming environment, inspiring live worship and a dynamic children’s ministry for birth though age 11. You’ll also get to enjoy the word streaming live from Pastor James on the big screen from the comfort of your memory-foam movie seat! We are excited about the growth that WOGM Bossier has experienced at the theater. 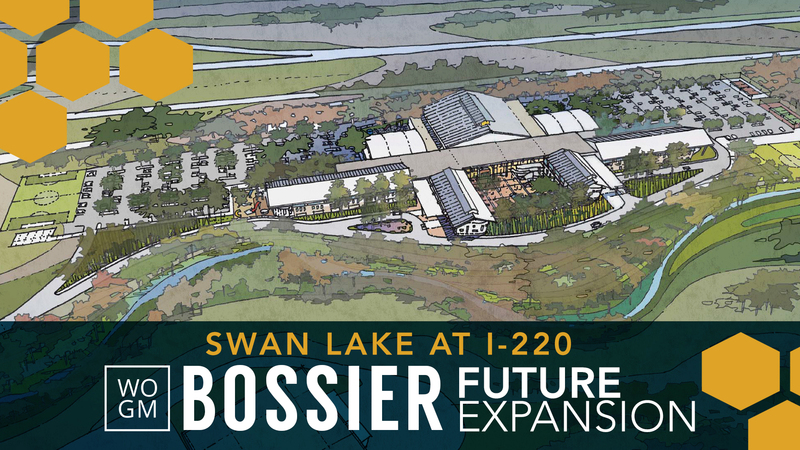 We know this is just the start of an even more powerful work that will be forged as we continue to develop the permanent WOGM Bossier campus location. Thank you for your support, and for praying with us as this vision unfolds. We can’t wait to share the future with you!